Hey you guys! 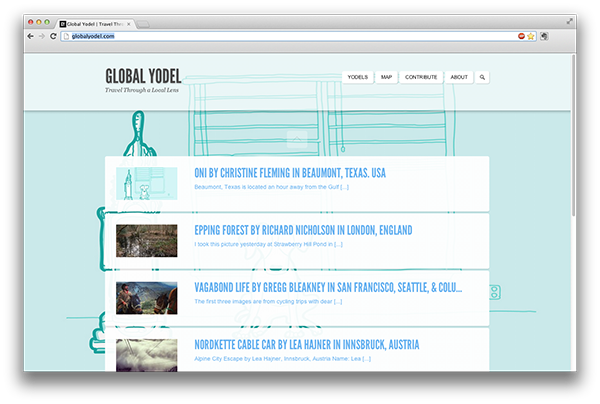 Today I get to announce that I’ve been featured on the travel/photography/illustration blog, Global Yodel! I have the honor of being today’s homepage feature as seen in the above screenshot. My illustration of Oni and the Vaccum is displayed as well as an interview with me about my life in Texas! Global Yodel is an awesome blog that features photographers, artists, and illustrators portraying their city as only a local can. Browsing the images gives you an insider’s peak into life in tons of different cities and countries around the world! Lately the website has been dominated by photography, but here’s to bringing the illustrations back!